How does broody hen behave? Typical broody behavior has the hen sitting in the nest box for up to 23 hours a day. She knows she needs to keep her eggs warm and rotate them often to make sure they'll hatch. A broody will come out of the nest one time a day for 20 to 30 minutes to eat, stretch, get a drink and to poop. Other than that, she just sits on her eggs. One other thing to note about a broody hen is that their poop is a little different. By different I mean huge and stinky! A broody will hold their poop for close to 24 hours. They wait until they get off the nest and then they make one giant poop of the whole day's waste. A hen that is not broody or a rooster that is sleeping in the nest box will poop the whole time that they're in there. So you can often tell the difference between a hand that's hiding in the nest box because they don't feel good and a broody hen, because the broody will not poop in the box. Isn't it interesting that chickens cannot control their elimination at other times though? Try reaching in the nest box to take the eggs while the hen is sitting on them. Normally a hen might get mad at you, cluck at you a little or jump out of the nest right away. A broody though, just might try to bite you. Broody hens have been known to growl and to get very defensive over their egg. They'll also give you some attitude after you takes their eggs. Like the side eye glare in the photo above! In fact, I've had the hen blocked off from the nest boxes and the broody has just sat on the floor in the corner of the coop...trying to hatch the bedding I suppose. Another indication of broody behavior is that if you move her eggs she will go and sit on the eggs somewhere else. Case in point in the photo below. I was power washing the coop and had moved all the Silkie eggs out of the next boxes and into a tub in the run. As you can see, all the broody Silkie hens piled into that tub and sat there the entire day as I washed the coop. Very few breeds take broodiness as serious as a Silkie does! If you remove a broody hen from her nest, she has a different stance about her than the regular pets. She tends to walk in a semi squat position with her wings held out. Plus she seems really cranky. This is the broody stance. 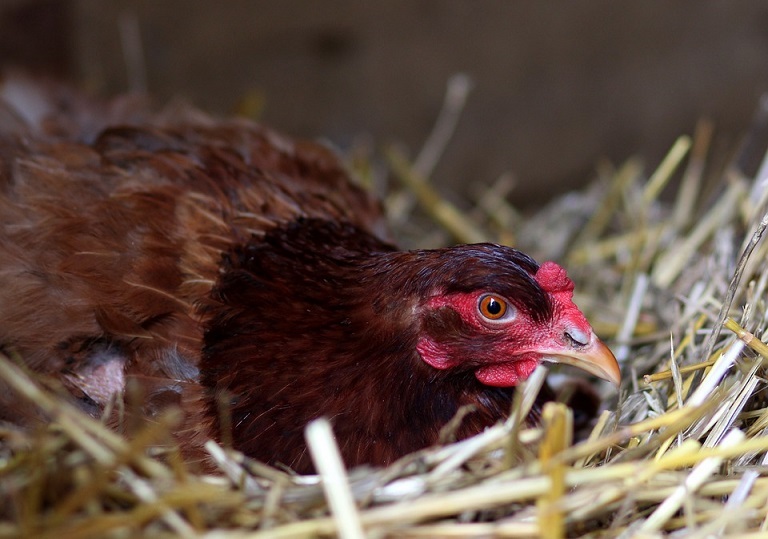 Now that you're sure you got a broody hen, what do you do? 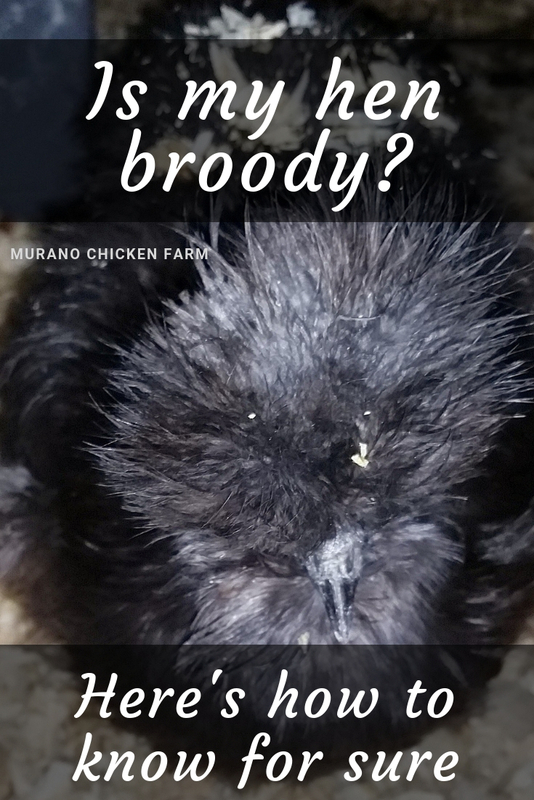 You have two options once you determine that a hen is broody. You can either allow her to hatch chicks or you can break her from being broody. I've written about both option in these articles: taking care of a broody hen or how to break a broody hen. Going broody every year is completely normal for some hens. Some are broody multiple times a year and frequency can depend on breed. Though it is a hormonal change in the hens be forewarned that broodiness seems to be contagious! Many chicken keepers will tell you that once they have one hen go broody it seems like the whole flock goes broody. So be prepared that if you do allow her to hatch chicks, you might end up with 6 broodys. It seems silly but it's true. My Silkie hens always go broody at the same time! Hopefully your hens won't all go broody at once though! It really puts a dent in the egg production!